Today in the forex market the Canadian Dollar (CAD) was weak across the board, driving movement and trading opportunities on all pairs in the group. 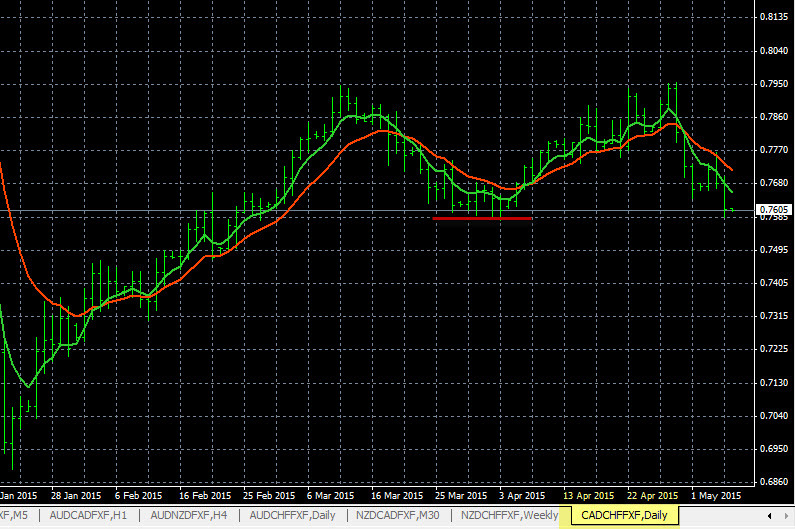 These pairs are also trending on CAD weakness, which is dominating movement in the forex market now. 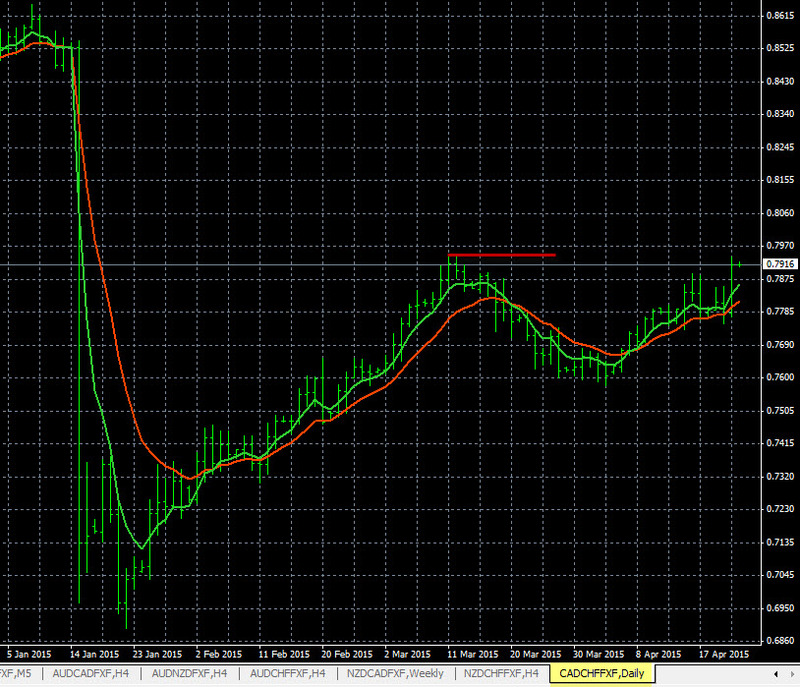 The USD/CAD rose and this pair is in a strong uptrend, it should continue much higher. The CAD/JPY also dropped, this pair has almost broken the 87.80 support area to the downside, with plenty of pip potential below there. We will look to continue to plan more trades on these pairs in the direction of their trends. The live signals you see below are from The Forex Heatmap®, which provides live signals for 28 pairs, including the Canadian Dollar pairs. The USD/CAD has a newly formed up trend on the D1 time frame. The current resistance level is at 1.3150, you can set a price alert here. When the alert hits check The Forex Heatmap® to confirm any buy trades. The next major resistance level is around 1.3400, so there is good pip potential above the alert price of approximately 250 pips. The trend indicators you see are 5/12 exponential moving averages set up on a meta trader platform. Today in forex trading the CAD/CHF had a sell signal on The Forex Heatmap®. This pair has cycled down to a heavy support level at 0.7350. We would be scaling our lots here or possibly exiting the trade completely. 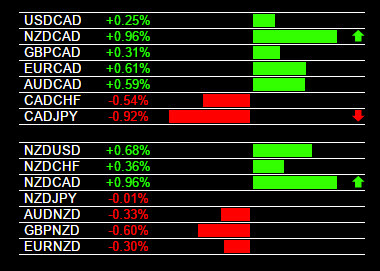 Other pairs like the EUR/CAD moved much higher today as the CAD weakness dominated the trading in the 8 currency groups we watch. The market is mostly ranging and oscillating between support and resistance now. The heatmap signal you see below is for the CAD pairs, but the heatmap monitors 28 pairs and gives real time trade signals in both forex trading sessions. 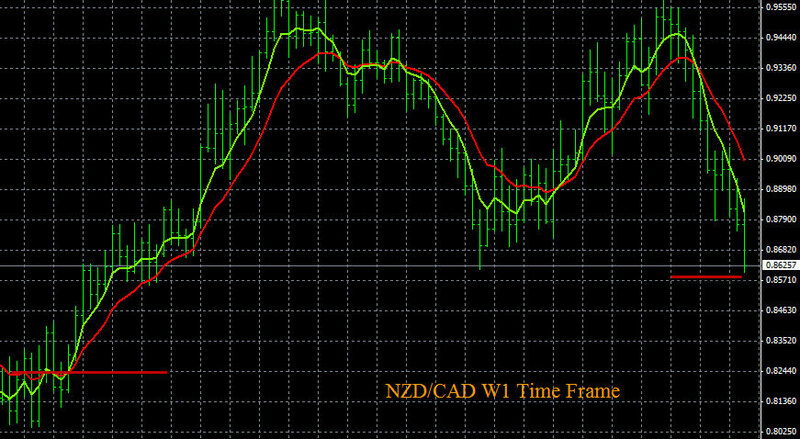 The NZD/CAD is trending down on the W1 time frame, shown on the chart below. This trend still has considerable potential. Current support level is at 0.8600, traders can set a price alert here. When the price alert hits check The Forex Heatmap® to verify any sell trades. The next major support level is around 0.8200, which is 400 pips below the alert price. Currently the New Zealand Dollar (NZD) is weak on all pairs, and New Zealand lowered interest rates today, which should support more selling. 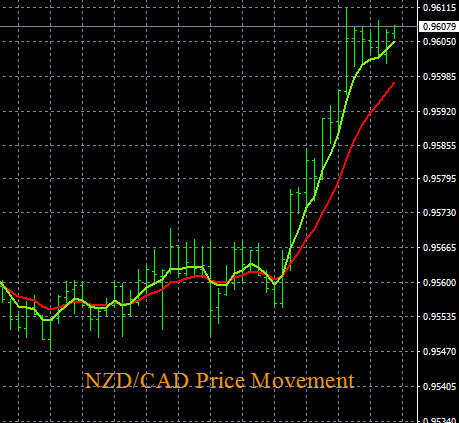 This analysis of the NZD/CAD was done with multiple time frame analysis. The CAD/CHF chart shows that this pair is trending down on the D1 time frame. Below the current support level at 0.7690, shown by the red line, it has a lot of pip potential. You can set a price alert here. When the alert hits, look for a sell signal below there on The Forex Heatmap®. There is about 300 pips of potential to the next support area on this pair. Most of the market pairs are indicating a strong Swiss Franc (CHF), which supports our analysis. The charts you see below are moving averages set up on a meta trader platform, then analyzed across multiple time frames. This is a trend analysis of the CAD/CHF pair. 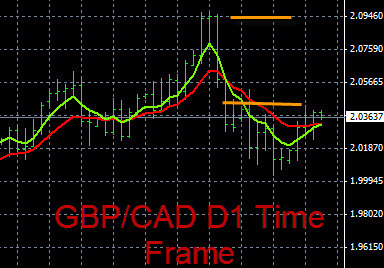 This trend analysis uses the D1 time frame and the developing CAD strength in the forex market. This pair has a significant resistance break out point at 0.7950. We are setting a price alert here in our trading plans. Above there look for a buy signal on The Forex Heatmap®. We see excellent upside potential and likely a trend developing on the larger time frames. The trend charts you see below are exponential moving averages we provide to our clients, analyzed using multiple time frame analysis, by individual currency.